For over 25 years, Vanco Construction has built the dreams of homeowners in Short Hills, NJ., as well as in the surrounding Morris County communities of Mendham, Bernardsville, Basking Ridge and New Vernon. Each year we focus our attention on a handful of custom projects, each ranging in cost from $1 million to $2.5 million. "Our approach begins with a clear understanding that producing a dream project is a team effort," explains Steve Vanadia, president of Vanco Construction. "The homeowner, builder, architect and interior designer must work as a team." A native of New Jersey, born in Newark and raised in Verona, Steve Vanadia determined at an early age that he wanted to become a builder. At 17, he began working with a local carpenter and later attended Farleigh Dickinson to study accounting. 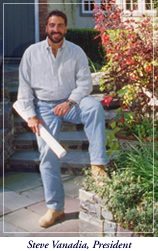 A framer by trade, Steve founded Vanco Construction in 1980. He considers himself very fortunate to work side-by-side with his wife Lyn, who has handled the bookkeeping details of the business since the early days. Lyn's creativity and supportive influence continue to contribute to the growth of Vanco Construction.